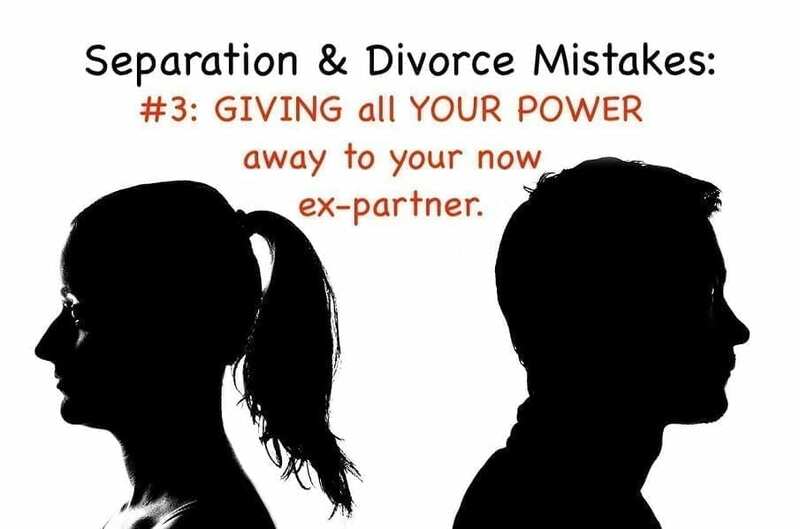 Often in a separation, especially at the start of a breakup, you give away all of your own power by focusing on your ex and everything that they appear to be doing to hurt you and ruin your life. You cannot believe what your ex did. You repeat your messy divorce story over and over. You cannot accept what your ex is currently doing. You resist what is happening and try to control what your ex is doing. You worry about what our ex will do or not do in the future. You spend a lot of time wishing your ex was different. You blame and do not take responsibility for yourself. Basically, you focus far too much energy on our ex. What you do need to do is take back your own power. Step back and try to gain perspective on your situation if you are able. Stop standing there, in victim mode, just watching your ex’s behaviour like a movie reel. Stop making your ex the main character in your story. Rewrite the script around you and what you want to do and start taking the actions you need to take. Stop thinking about your ex and start thinking about YOU! Start looking at your own situation and your part in it. What do you want in your life? Out of your life? What are you doing to look after yourself? What are you doing to be the best version of yourself you can be? What are you doing to gain the knowledge and skills you need to work through your separation and rebuild your life? Trust in your relationship usually evaporates as it ends. The person you love and thought you knew very well appears to be a complete stranger. Patience, empathy, understanding and healthy communication are often no longer possible. We only control our own thoughts, our own emotions, and our own actions. You cannot control anyone else – ever! Their thoughts, feelings, and actions are completely their own. That lesson, sadly, took me a long time to learn. So how are you thinking about the situation you are in? Are your thoughts helpful to you? What are you feeling about your separation? Are you letting your emotions come up and processing them, or are you avoiding them? Are you reacting, acting, or taking no action in a way that serves you? Are you working to make things better for yourself and your family? Stop focusing on your ex and their misdeeds and bad behaviours. I am not saying to ignore this stuff. Always protect yourself with awareness but don’t let it control you or take you away from your own work and forward momentum. Do not let your ex have any control over how you are thinking, feeling and acting. Choose what YOU want to think, feel and do. Stop reacting and start being proactive with your own results in mind. Make yourself the most important person in your own story. What small step can you take today to start your path to healing? me would be a good fit! Often in a separation, especially at the start of a breakup, people stop looking after themselves. Are you guilty of any of these things? You worry about what others think so you pretend things are “fine” despite not feeling fine at all. You attempt to control things that you have no control over like other people. You power through, like the energizer bunny, despite emotional, mental and physical exhaustion. You don’t listen to your own precious body. You resist and fight change instead of accepting what is. You stifle and avoid your emotions. You blame yourself – you may feel guilty. You beat yourself up mentally and are downright mean to yourself inside your own head. You put yourself at the bottom of your to-do list. You forget all self-care – who has the time or the energy for that when your life lies in ruins around you? Think of self-care as your own personal energy bank account – similar to a regular bank account. and spend wisely on things that are important to you. Making yourself a priority and investing in your self-care during separation and divorce is absolutely essential! If you won’t look after your own needs – who will? You certainly don’t want to depend on an ex-spouse to meet your needs! Self-care actually shows people how YOU want to be treated. Set a good example – treat yourself well! Save as much of your own energy as you can. Don’t let others take your energy especially, people that drain you emotionally. Minimize activities and interactions that deplete you and wear you down. Learn to say “No” and remember you do not need to justify your “No”! Conserve energy for your true priorities. Spend your energy wisely on the important things that will, eventually, increase your own energy over time. Some difficult things may seem to deplete you – these are actions like setting healthy boundaries, but they will benefit you over time if you maintain them. Make regular deposits to fill your energy account up. Deposits will strengthen you up and make you more resilient. Build up your strengths, your confidence, your skills, your knowledge. Make sure that you are meeting your own needs first. It really does add to your life, similar to money in a bank account. Are you looking after yourself well? Are you creating or continuing to practice good habits to look after your body, mind, heart and spirit? Are you giving yourself time and space to feel your emotions, rest and replenish yourself? Are you speaking up for yourself and setting healthy boundaries with others? What would you say to your best friend in a similar situation to what you are facing now? How would you treat them? What would you tell them? Try to treat yourself like this best friend that needs your support, care and love. Treat yourself with compassion, understanding, respect and kindness! It is always easy to look back at things and understand them better, but you really did do the best you could with what you knew at the time. Do not beat yourself up or be hard on yourself for the past. It is what it is. Allow yourself plenty of time and space to look after yourself. Schedule some time to be alone to just think and feel. Actually, pen it into your own calendar! Self-care is the best thing you can and should be doing right now for yourself. We only get one body in this life. One mind. One heart. One spirit or soul. If you are struggling – take the time to be present. Show up for yourself and listen to what your body, mind, heart and spirit are telling you. Celebrate and be grateful you have everything that you do have in this moment! Get to know your strengths and weaknesses. It is all good. Nurture all of yourself – build up your body, mind, heart and spirit so you can handle the changes that separation and divorce will throw at you. Don’t give yourself any time limits on grieving your relationship or healing. Separation and divorce are a marathon, not a sprint. Build yourself up to make it through to that finish line. It will get better with time and positive action. Divorce really is a journey. Rest when you need to. The time you rest is just as important as the time you spend moving. Work on the skills you need to have. Self-care is a life long process. Keep doing it no matter what! My coaching will help you make yourself a priority – you can book a free strategy session here to see if coaching with me would be a good fit! One of the hardest things about separation and divorce, is all the memories and emotions that come up during all our special holiday celebrations as our holiday traditions change. 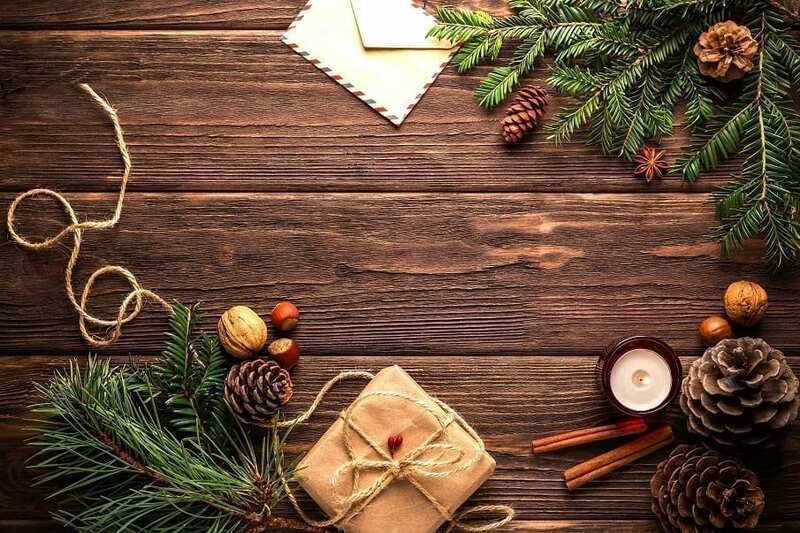 The first Christmas, or if you do not celebrate Christmas – whatever you do celebrate, without your full extended family, is probably one of the most difficult times in the first year of separation. Kids, if you have them, may have to spend their first vacation divided up between households, and they will probably find things difficult to adjust to as well. Here are my top 6 tips about improving the holidays for you and yours when you are first separated. Do not expect things to go as you plan or want them to. They probably won’t. It is better to stay open to new possibilities than to have expectations of how things should go during the holidays. Keep an open mind and an open heart, and embrace both the unexpected fun and difficult moments. Life happens and time marches forward so spending energy fighting or trying to control the change happening during this time is just a big energy drain. Enjoy the small things and keep moving forward as best you can. Things may not be perfect but sometimes there is also humour in the fails. I found that laughing when things became ridiculous really did help ease my burdens! During the holidays simplify everything you can. When you are going through a difficult and stressful time, just surviving is a good goal to aim for. Surviving as best you can is the key – stop aiming to be a superwoman or a superman – stop trying to be a super parent – stop being perfect – stop doing it all – relax and make a list of nice-to-haves and must-haves. Then be ready to cross out some must-haves if the going gets rough. I know when I was married, I had a large Brunch every December for my extended family and closest friends early in the month. I did it so my kids were not disappointed the first year I was a single mom and it completely drained my energy for the rest of the month. I wished, after it was done, that I had not tried to act like everything was fine and I could still “do it all”! You have my full permission to simplify and cut out your energy drains and add more energy recharging activities to your list. Everyone is different. Do what works for you! The holidays are often full of traditions that we may not even enjoy anymore. I know I loved getting that real Christmas tree when I was married, but was quite happy to go for an artificial tree when I was a single mom and not have to worry about how to get a tree in and out of my home. Creating memories doesn’t have to be expensive or fancy. Discard the traditions that just do not work this year. You can decide if you want to do them again any time in the future. What do you enjoy? What won’t you miss? What will be a relief to take off your calendar and your to-do list? I started a few new traditions that I enjoyed that we had never had the time for before. We started sleeping over at a relative’s house Christmas Day after sharing a Christmas dinner, so I could enjoy the family time as an adult after I put the kids to bed. We stopped going out to a Christmas Eve party that was a long drive and often happened during stormy weather. I started enjoying a walk to look at the Christmas lights Christmas Eve, which was always a really nice change of pace! Then, of course, some hot drinks, cookies and a Christmas movie were a great new tradition. It actually was a return to some great childhood memories for me. 5. Be patient – it is what you make it. If something doesn’t work this year for you – make a mental note and re-evaluate it for next year. Do you want to stop that tradition, alter it, or start something different? Nothing is set in stone. Focus on what works for you and yours! Examining what traditions you enjoy or dislike and adjust to your life as things happen in real time! Change can be good! Patience for making and adjusting to the changes is important, especially with your children. They need just as much time to adjust and start to flourish in their new situation as you do! I also want to mention that other expectations can be exhausting this time of year. Be honest and tell people you are reevaluating and simplifying this year. Next year may be different, but this year you just do not have the energy. Stand up for yourself and decide what you want. Then clearly state and defend your decisions with healthy boundaries. There is nothing wrong with cutting back and if people do not understand why you need to, it is their problem, not yours. You are only responsible for and to yourself. You never have to justify your decisions to others. Those that truly are important in your life will understand and support your decisions. If you would like to have some help navigating the change, the emotions, or the process of separation and divorce, I do offer a free strategy session. Please fill out the form and I will let you know what times would work to connect. I felt such an amazing flood of relief. I remember crying very hard, full on messy sobbing. I had felt tremendous responsibility for a clinical depression. Over the years we had talked about things a lot, worked on ways to improve our lives and eventually sought professional help. I had found that most of what I did to ‘fix’ our relationship was not helping much. I was at a loss on how to improve the situation. What I was doing to try and buoy my partner up was making me more miserable and not helping him. Looking back I want to emphasize that “I” was part of the problem. Over time I had given up much of my own identity. I stopped doing what I liked doing, stopped having time or energy to do what brought me joy and worked hard and focused on trying to solve the problems that kept coming up in our relationship around unhappiness – not my unhappiness but the unhappiness of my partner. I gave up my hobbies, my joys, my dreams and even most of my social connections and my job. (Yes – I encouraged a moved away from my entire support system because he was unhappy and I thought moving to another company in another city would help!) Trying to make or keep someone else happy is exhausting. Of course, the new job in the new city was great for a short while. Then the same issues surfaced and we were right back at square one. This time I had little support as all my friends and family were miles away. Finally being told that I was not responsible for another person’s unhappiness was a true gift. It was not my job to drag another to find happiness – especially since I now realize that they did not have the same ideals or values. I still worked on things for many years before my marriage did finally end, but knowing what I know now I think I would have done more to improve my own situation much earlier. I had felt a sense of duty and obligation which kept me invested in an unhappy marriage far longer than I should have stayed. I was throwing everything I could at fixing the problem when it wasn’t really my problem to fix. Happiness really is an ‘inside’ job. You choose how you feel and can to a large extent control how you feel. No one ‘hurts your feelings’ – you choose to be hurt. 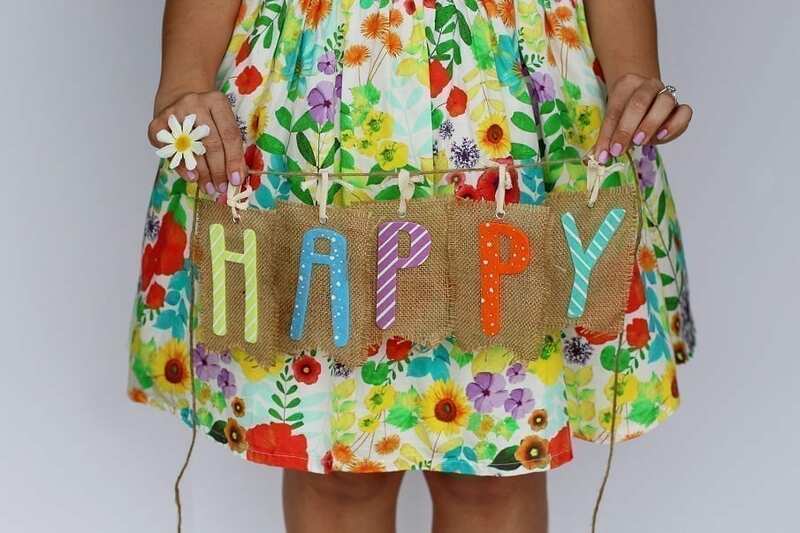 Not everyone wants to be happy. You cannot change anyone except YOURSELF. You can do things that affect others but you cannot change or control how other people think, feel, react and act. Others need to WANT TO CHANGE themselves to create any change. Changing oneself is hard work. You need desire as well as time, energy and persistence. Please contact me if you would like help navigating through your separation or divorce. I do offer a free strategy session. Who is Responsible for How You Feel? Often, a separation or divorce brings up some very difficult to manage emotions. We usually blame our ex-partners for all our difficult hurt feelings. It must be their fault that you feel sad, mad, bad or even glad. May I suggest that your feelings are actually much more under your control than you realize? Emotions are your choice. Difficult feelings will not completely disappear, but I find it very comforting to understanding that you have some control over your own emotions. Circumstances happen and create a ‘situation’. Your beliefs dictate the story you tell yourself about the ‘situation’. This story is your version of the truth – it really is just your story or narrative about the ’situation’ according to what you believe and how you interpret things. The story you tell yourself will affect how you think about the situation. How you feel will be dictated by your own thoughts. Then you react to your own story. Your interpretation of the situation, with the actions you think are appropriate to take, or you decide to take no action at all. This reaction, or lack of action, will dictate the results you get. So, it is really all about what story your thoughts are creating – HOW AND WHAT YOU ARE THINKING – that will dictate how you feel in any given situation and how you will respond. If you stop for a moment between the ‘situation’ and the ‘story’, can you change your thoughts, feelings and actions? YES, you can change your interpretation of the situation! Try not to take everything personally. Often things have much less to do with you than you think. Try to understand the actions of the others involved. Feel empathy for them and things will be much easier to handle. So, in summary – you decide how you will feel about any given situation by telling yourself a story. Is the story true? Are things perhaps different than what you see? What were the true intentions others actually may have had? Examine your assumptions and look for other possible explanations. 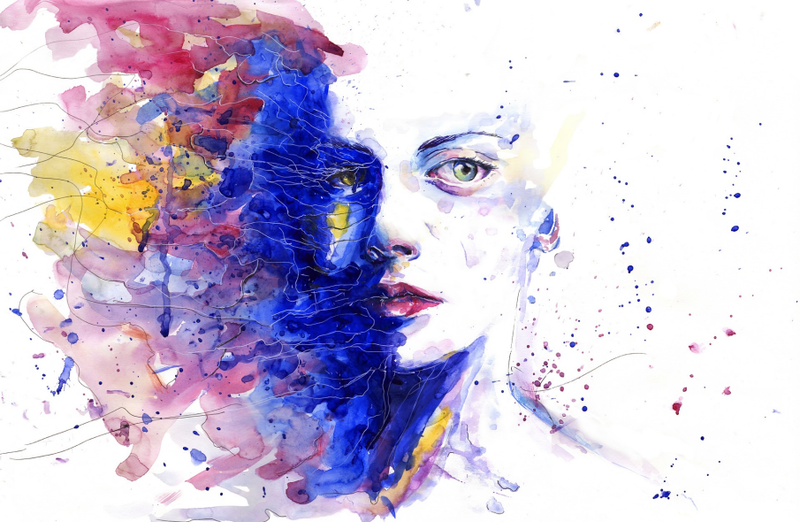 Byron Katie developed an amazing and original tool around managing feelings that you can use whenever you are finding a situation difficult to manage emotionally. Her tool is called simply ‘The Work’. ’The Work’ is a process that asks questions then uses some ’turnaround’ questions that can completely change the story you are telling yourself. Try it! I use an app called ‘The Work of Byron Katie’ which takes you through the entire process on a smartphone. If you would rather get the paper version, Byron Katie’s website is simply thework.com – please check it out. You can find Byron Katie’s Judge-Your-Neighbor Worksheet here. Is it true? How do you really know it is true? Does this thought bring peace or stress into your life? Let me know what you think about how knowing the way you are thinking about a situation can change how you feel, how you act, and ultimately your results. Please contact me if you would like help navigating your separation or divorce. I can help you better manage the overwhelm. I lost over 30 pounds and felt sick most of the time. I got compliments on how “great” I looked. “Thanks,” my ‘happy mask’ said. Everyone wanted to know my weight loss secret! I would not say it was unrelenting STRESS! I didn’t want anyone to judge us if we stayed together. He finally decided to end our 20-year marriage. No more trying to understand things that made no sense to me. No more walking on eggshells. I had a deep feeling of fear in the pit of my stomach. Separation and divorce changed every aspect of my life. Our kids, our friends and family, our finances, our home and all our possessions were on the table being divided up. Our life, our memories, our shared history and our privacy – everything no longer held between just the two of us. Everything was out there in the world, very public, looking tainted and ugly. Years of ‘good’ memories downgraded with new knowledge. You never understand the extent of the losses until you are in the thick of it. Rebuilding from the rubble after my relationship ended was very difficult and took time. Sometimes I wondered if I would ever feel okay again. Emotions were in high gear and logic was in low gear! Ironically this is the precise time when I needed good logic and competent decision-making skills. I came through it all, did the hard work involved and emerged better on the other side. Stronger, more confident and ready to choose what I wanted to include in my life. I knew exactly what I was looking for and started taking small steps to get where I wanted to be. Now more than 12 years have passed since my separation. I have rebuilt every aspect of my life. There are few reminders of my previous life around me except my children and a few true friends. I enjoy a healthy relationship with an amazing man. I have a new extended family that loves me. I gained some great kids and grandchildren along the way! I call a different house in a different city home. I have a new career. Looking back, I did a lot of the right things. I am grateful I did okay. One thing that helped was called a course I joined. This course and support group gave me insights into my emotions, clarity about what I did want, issues to think about and act on, basically a pathway to rebuilding my life and the support of others in similar circumstances. I am trained as a divorce coach so I can now help others overcome the hurdles which separation creates, cleaner and more efficiently than I did. I am excited to announce I am offering a rebuilding course, which I call ‘Blue Skies Ahead!’ again this fall. Based on the same foundation as the course I took years ago, with some updating and creativity to make it current for people right now, it starts with ‘denial’ and goes through 19 ‘rebuilding blocks’ to end with ‘freedom’. Freedom to create the life YOU want to live. I want to support, guide and motivate you through your stress and help you rediscover your strengths and dreams! Support through the difficult lessons! Guidance to apply what you are learning! Motivation to step up and create the life you want right now! 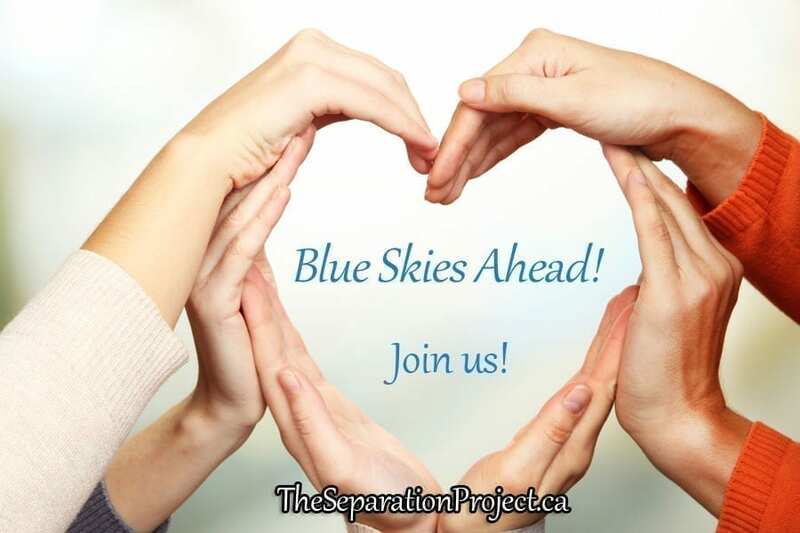 Please visit ‘Blue Skies Ahead!’ Healing Through Divorce for more information or to pre-register. If you cannot come to Dundas to participate in person, please email me, as I may offer this course online. Let me know you want to take it and I will create it if I get enough interest! I really am here to help you through your time of need! I also offer 1:1 divorce coaching. 7 Ideas about the Intense Emotions Felt during Separation and Divorce. The emotions usually felt during separation and divorce do follow a pattern. Many others have gone through similar emotional journeys. You, and others in your family, although you are on the same journey, will probably be at very different places and feeling very different emotions. 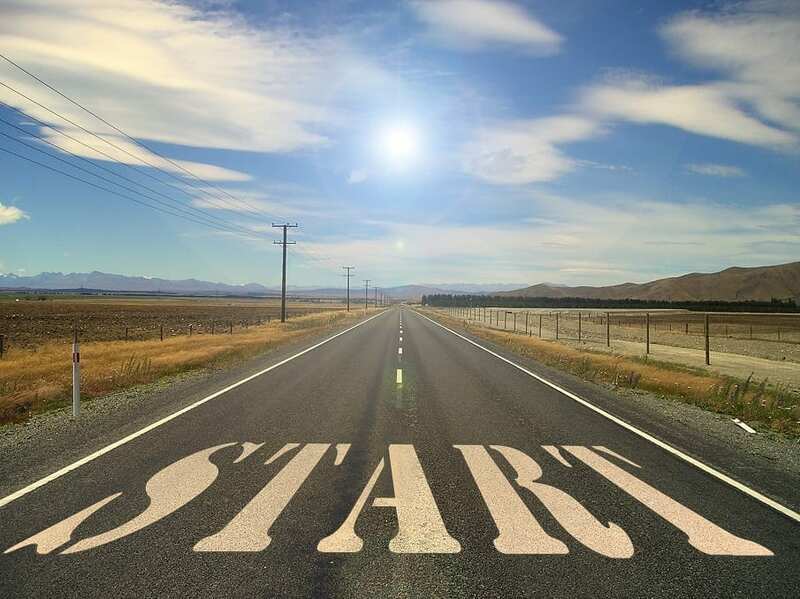 The stages and feelings will be similar but the start and end of the journey will not match up, so you will usually be at different stages of the same journey which will make things more contentious and difficult. Usually the person that has decided to initiate leaving the relationship is emotionally further along in their journey than the person being left. Two years ahead is often the normal situation. This is why, early during my own separation, I was so upset as my life crumbled around me to see my ex appearing at peace and even positive about the situation! No-one has control over how anyone else feels – you can only control how you feel about your own situation, react and act. Feelings are just that – feelings – they are never wrong or bad they just are. You cannot speed anyone else through the process no matter how frustrated you may be that they are taking too much time to ‘get over it’ or are being ‘unreasonable’. The children, if there are children, will also experience a similar pathway through the breakup, but they will have little control about how things end up for them or their parents. They too will probably be in a different spot in the valley – usually behind their parents. Please show acceptance of whatever they are feeling, and show them patience wherever they are emotional. Validating how they are feeling can be very powerful. If your kids do manage to handle their emotions well, do not let them become the parental figures in your family! Own up to your emotional issues and be the parent. Children really do deserve a childhood! 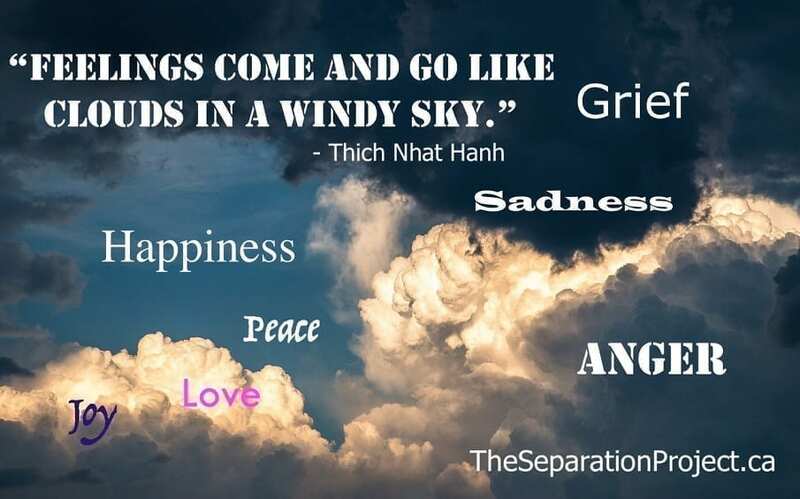 Grief is part of the separation process which can surprise some people. Some cannot understand why there is ‘grief’ at all. With no funeral or body, why do we need to grieve? Trust me, your relationship, as you knew it, is dead and you do need to process the situation if you are separating as true grief. Grief will always take longer than you think. Let yourself have lots of time and be very patient with yourself. Grief is a bit like ocean waves lapping at your feet on a beach. The waves will ebb and flow. Some waves will barely touch your toes and some will knock you over with their power. A big wave of grief can suddenly hit you with no warning and you are right back in the thick of your full emotions. Thankfully, like waves in the ocean, it will also subside and the next wave will hit with less power over you. I remember driving the car, and suddenly finding myself crying so hard it hurt. I wasn’t even sure what triggered the outburst, but as quickly as it started, it was over. Thinking about emotions as transient can help. Feelings come up and pass through just like the clouds in the sky, or bad weather. When you get emotional about something, it will always pass. Eventually, every emotion will dissipate and change to another emotion. If you know that your feelings will pass like the weather, you can observe them with more acceptance and less judgment. Don’t label your emotions as good or bad. They just are! If they come up, accept them as they come. Often, if you just suppress your feelings or try to avoid them, the same emotions will keep resurfacing in your life. The struggle to keep fighting with your own emotions will drain your energy. It is better to feel the feelings and release the emotional energy as best you can. You will be pulled through emotional highs and lows a bit like a rollercoaster. Sometimes the feelings may change quickly and sometimes they will come and go more slowly, but change they will. You will get pulled back into emotional stages you think you have finished and resolved. The high-intensity fight or flight response is often triggered during separation and divorce. Learn to recognize this response and do not make any decisions while you are emotional and not thinking straight. Please contact me if you would like help with your separation and divorce. Good decision making during separation and divorce is often hijacked by strong, out of control and overwhelming emotional reactions. Just when you need your logic, creativity and problem-solving skills the most, your thinking brain shuts down, and you become very reactive and unable to think straight. This emotional response to perceived danger is due to the fight or flight response. I do find that a simple understanding of how this reaction is triggered, and your emotions arise, can help people manage better during separation and divorce. Our human brain consists of 3 basic parts according to Paul Maclean and his Triune Concept of Brain and Behaviour. This theory suggests your brain has evolved to have three basic components built on top of each other. This blog is my very simplified understanding of Paul’s theory. The reptilian brain is the most ancient part of our brain and it is constantly scanning the horizon for danger and threats. Like a lizard watching for some imminent threat, we still constantly search for danger and are ready to react instinctively. When a threat is detected the reptilian brain immediately goes into what is often called the ‘fight or flight response’. This response makes us ready to either fight for our very survival or run away from the danger. This is a great response if you are a lizard. Lizards do not have emotions and usually react with automatic or ritualistic patterns created to resist change. Reptiles do not get emotional like we do and just fight to protect themselves or run away. The mammalian brain is the source of our basic emotions. Our emotions help us view events as agreeable or disagreeable so we can learn to both avoid pain and seek pleasure. Emotions help us store our memories and learn new things. A key difference between a reptile and a mammal is that you cannot teach a reptile tricks but you can train a mammal. Mammals are capable of learning new behaviours because they have emotion. Emotions are considered a good thing because they allow us to learn and change our reactions. The primate brain is the seat of higher thinking, reason, and logic. This is where our human intelligence, or lack thereof, sits. This primate brain actually has limited direct control over your emotional mammalian brain and almost no control over the reactive reptilian brain. In short, you cannot ‘will’ your emotional brain to do much, or your reptilian brain to do anything. You can, however, teach yourself to react to your emotions and instincts in desired ways, continue to learn from them and choose to respond differently. 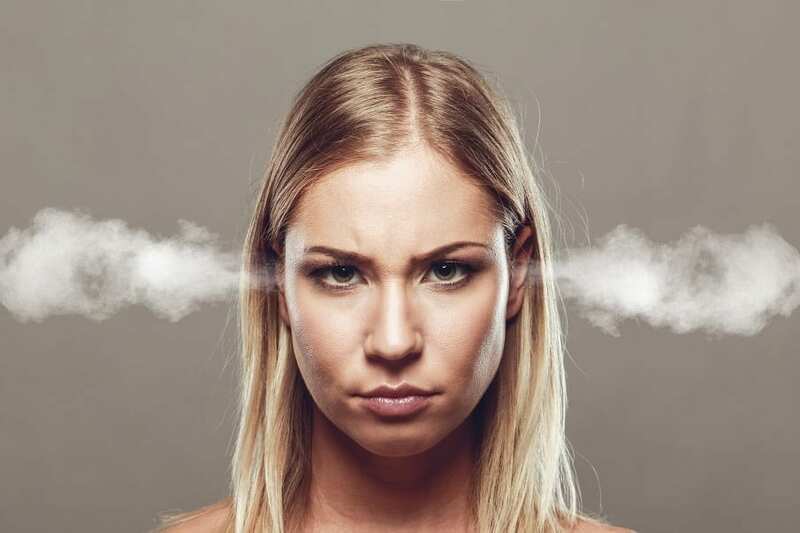 When you have a fight or flight response triggered, common in arguments during separation and divorce, your body instinctively reacts and floods your body with chemical messengers that cause you to prepare for a fight or run away. As the body floods with these messengers, we feel them as our emotions. The higher thinking brain, in a fight or flight response, actually gets shut down as your pounding heart redirects blood to your large muscles to fight or to escape. Interestingly, this response means that you cannot think well at all and definitely cannot make a good logical decision until the chemical messengers work their way out of your system. How can you best cope with the hijacking of your emotions? Recognize that the flight or fight reaction is a normal and very human reaction. Learn to recognize when you are being emotionally hijacked by how you feel. Acknowledge that your emotional state is not serving the situation, and you would like to return to the problem when you are calmer and more able to think and talk. Remove yourself from the situation quickly – before things are said or done you will regret later. Allow yourself the time for the chemical messengers to clear out of your system – this normally takes a minimum of 20 minutes and longer if you are repeatedly triggered. Give yourself the time needed to break down the adrenaline and return to a more normal state. Physical activity like a run or heavy exertion can help speed up the depletion of the adrenaline in your system and help your recovery faster. Wait for calmness to return and your thinking brain to come back online before you return to the situation that triggered you. In separation and divorce, it not only makes a lot of sense to give yourself time to calm down and be able to reason again,it also makes good sense to let your partner, soon to be your former partner, to do the same if you want both or you to make better decisions and reach any agreement. Be patient. You can only communicate clearly. This includes listening and actually hearing what is being said, as well as responding reasonably when your thinking brain is capable of it. You can only negotiate well, with reasonable outcomes, when you are both calm and not overreacting emotionally. Practice good self-care to keep yourself healthy to help you increase your resilience to overreacting. Please contact me if you would like more help dealing with your emotions! 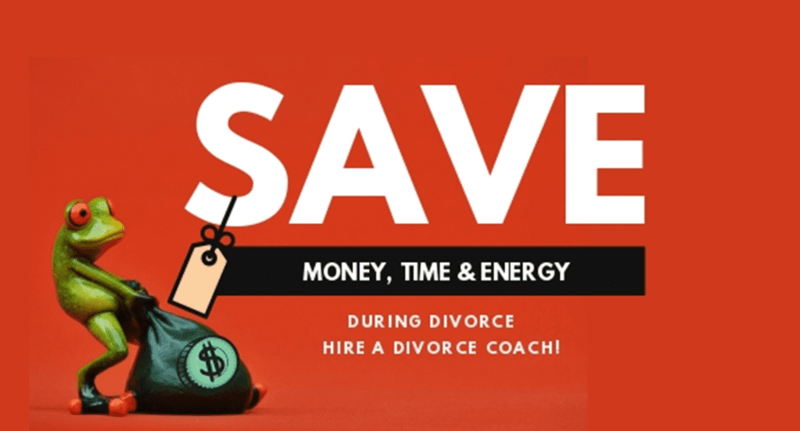 I passionately believe that hiring me as your Divorce Coach can actually save you money – big money! I often find people resistant to paying for specialized professional services during their separation and divorce, because they feel that the legal costs are already overwhelming them. There are some very helpful divorce specialists that can save you money in the long-run, which I always recommend before the lawyers get involved! A Divorce Coach can honestly help you minimize your overall divorce costs – the financial cost, the toll on your health and well-being, and the often extensive damage to your family. How can a Divorce Coach save you money? 1. Avoiding the common mistakes and blind spots. Often in the middle of a marriage breakdown, it is hard to see other perspectives, except your own. As an outsider looking in on your situation I can much more easily see what you are avoiding, ignoring and not aware of. I can help you navigate away from the common mistakes and point out your blind spots with honesty and understanding. 2. Helping you find the correct path through. Most couples going through a separation and divorce have never been through it before. Often friends and family try and help by giving advice and sharing stories of how a friend of a friend had a horrible divorce. Misunderstood ideas and just plain incorrect information can cause you to spend a lot of time and money doing things that are not helpful for you! I can help you find your best pathway through a separation and divorce because I help people successfully navigate similar issues all the time. I share knowledge and resources that will be tailored to your unique situation and will help you avoid wasting your energy, money and time on things that will not help your situation or outcomes. 3. Help you become a more credible divorce client. I make you a more credible client for the other divorce professionals you will be hiring, so you spend less money and time on things that are unnecessary or out of their comfort zone. Going to the right professional for what you actually need, and only what you need, and only using those professionals you do need, is as important when hourly rates are high. I help you sort out what you need, how you can get it and from who, most efficiently. We can then get you organized for effective meetings that will minimize your costs. 4. Keep you focused on your intentions and avoid costly detours. One of the most important functions I perform as a Divorce Coach is to keep you focused on what outcomes you want and how you are more likely to get them while being your ‘best self’. Staying true to your values and behaving well really does help create better outcomes for everyone. If you look back at this time in your life 5 years from now, will you be proud of how your divorce went? Will you feel shame, or will you still be fully engaged in an ongoing conflict? I am very passionate about people having better outcomes, more timely resolutions and being able to maintain a reasonable relationship with their ex-partner. The benefits of coaching to your health and well-being, your finances, your time and your energy level can really add up. I do wish that I had found a divorce coach, like myself, to help me out when I navigated my own separation. If Divorce Coaches had existed back then – finding one with my best interests at heart and the experience to help me go through the process with more ease, would have been wonderful. Please contact me to discuss how my divorce coaching works. I do offer a free strategy session and would be honoured to talk with you about your situation.